"God Looked Away", the new play about Tennessee Williams by Dotson Rader, has just opened at The Pasadena Playhouse from Feb. 8 thru Mar. 19. Dotson Rader based the play on his memoir about Tennessee Williams, which was titled, "Tennessee: A Cry From The Heart". The memoir was a penetrating look into the heart and soul of one of America's most famous playwrights. The play stars Al Pacino, Judith Light, Garrett Clayton and Miles Gaston Villanueva. It is rumored for a future Broadway production. Dotson Rader!!! Is he still around? I knew him slightly, in the early 1980s. Yes, the play is a part of an Inaugural Playwrighting Workshop at The Pasadena Playhouse. 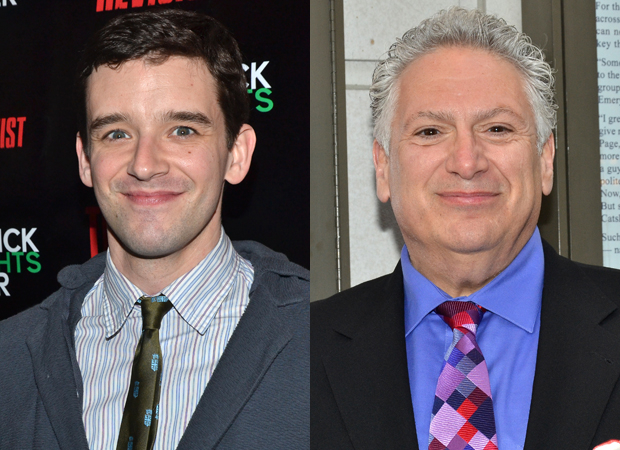 Michael Urie will star in an Off-Broadway revival of "Torch Song Trilogy" at Second Stage Theater in October of this year. Harvey Fierstein has edited the original text and has decided to call it - "Torch Song". It will be directed by Moises Kaufman (of "Gross Indecency" fame). Interesting story - years and years ago I worked in a place that was typing (yes on a typewriter) Barbara Baxley's autobiography. Anyway she was a friend of Williams and used to call him Tenn. At one point on her yellow tablet sheets she had written about "Tenn" picking up guys in the street and then crossed it out in pencil. Yes, I saw that episode on Decades a few months ago. Love the jazz combo Dors sings with in the show and that nightclub setting. I knew Jim Bridges' boyfriend, Jack Larson, very well. Wonderful man. Jim Bridges wrote several Alfred Hitchcock hours, he was an excellent writer. He wrote the famous episode about the two nurses in a house while a serial killer was on the loose - I seem to remember it was Reta Shaw, Dana Wynter, and John Kerr. Terrifying. I can still remember the moment my dad went from the couch to the ceiling. Couldn't sleep for several nights. You raise an interesting point. Some people know they are gay at a very young age. I've never known if you could just decide to be gay or straight. I know someone advised a gay guy who was getting heat from his parents to ask them to be gay for a week. Meaning they couldn't so how could he suddenly just "become" straight. I have no answers of course. But I do like the statement that regardless of why, they should be treated equally and with dignity. It's amazing to me that he did Victim. Interesting guy. He and his partner moved to France. After his partner died and he had had a stroke, he had to move back to England. His partner, Tony, was married to Glynis Johns and had a son. Tony had affairs with a lot of well-known women before hooking up with Dirk. He was absolutely wonderful, and I loved that documentary. And so handsome. One of my blond exceptions. Wasn't she hoping to marry gay playwright, William Inge? Yes, I have noticed his name in the writing credits. His performance in "Victim" was such a great performance. It must've come from years of pretending to be straight on screen. From what I've read, he and his partner were very loving. I can always watch Dirk Bogarde. A recent treat was his performance in "The Doctor's Dilemma". Tab Hunter was "blond" in a way that no other man could be - gorgeously, memorably BLOND. She was unhappily married to someone else who had a mistress. Honestly, when I started typing this thing, I remember thinking it was fiction! Then she started dropping names and I realized who it was. The guy that was working with her finally quit, saying he couldn't stand it any longer. She must have been a complete neurotic. I love Dirk Bogarde. His biography by John Coldstream is one of the best I've ever read. Very thorough and fantastic. And it took a lot of guts to play the character in "Victim"
Yes, it did, and it re-defined his career. 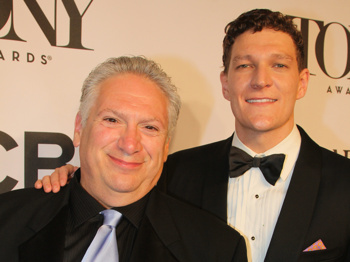 Harvey Fierstein and Gabriel Ebert will star in Martin Sherman's play, "Gently Down The Stream", which opens at The Public Theater in downtown Manhattan from March 14 - May 14. 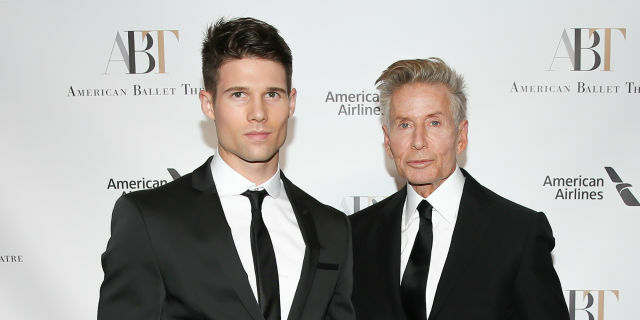 Does the kid have to call Calvin grandpa? I have always wondered how, overall, the gay and lesbian community feels about relationships were there is a big age difference. Of course there is often a gender divide with heterosexual relations; E.g. women are labeled cougars, which has a negative connotation, often by other women, while men, are high-fived by guys their own age for being with a younger babe (but generally women look down at the men and women in such relationship). There are the classic terms such as gigolo and gold-digger. Are these terms also used for non-heterosexual relationships that fit that profile?